NETWORK UPDATE: SUPERSTORE and both SUPERGIRL and SCORPION gained 0.1 in final numbers, but THE BACHELOR LIVE aftershow lost 0.1. CABLE HIGHLIGHTS: Without MONDAY NIGHT FOOTBALL to contend with, Monday cable was VH1’s for the taking, which it did with LOVE & HIP-HOP, up 0.06 to 1.56. Its lead-out was THE BREAKS, a 2-hour movie that scored promisingly as a back-door pilot at 0.95, in the same vicinity as BLACK INK CREW has been doing in that slot. USA’s WWE telecast was at 1.26/1.21/1.19, close to last week’s 1.23/1.21/1.18. 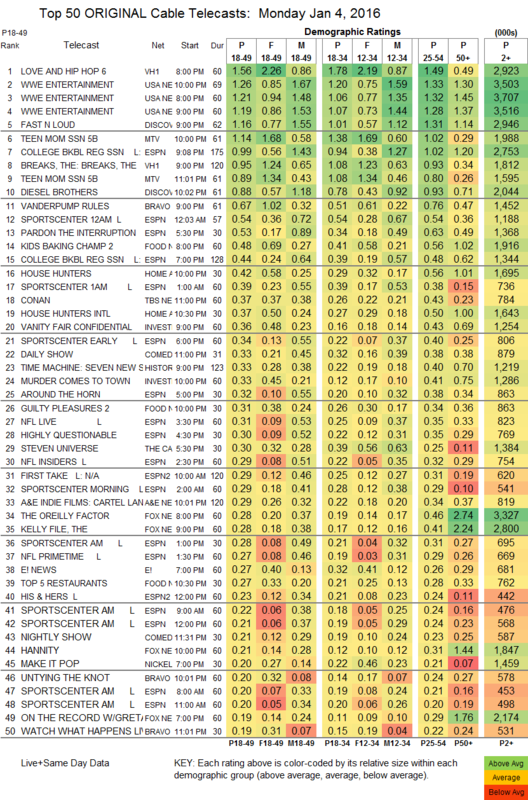 Discovery’s FAST N LOUD returned at 1.16, followed by DIESEL BROTHERS at 0.88. MTV aired two TEEN MOM episodes at 1.14/0.89. ESPN replaced football with a COLLEGE BASKETBALL doubleheader and scored a more subdued 0.99/0.44. 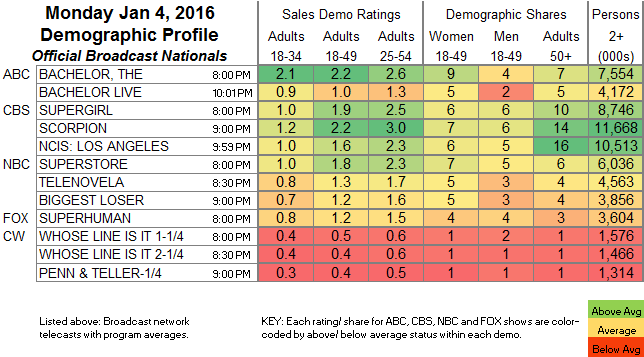 On Bravo, VANDERPUMP RULES was at 0.67, but lead-out UNTYING THE KNOT lost most of that with 0.20. Food Network’s KIDS BAKING CHAMPION was at 0.48. On Comedy Central, THE DAILY SHOW made its 2016 return with host Trevor Noah standing for his opening jokes, some jazzed-up theme music, and 0.33.